John of God, thru channeled message had developed Crystal Light Bed for practical use and incorporated it as an important healing element at the Casa de Dom Inacio (House of Saint Ignatius). Ewa & Jan have been entrusted by John of God and the Benevolent Spirits that work with him to bring back a Crystal Light Bed home and offer Crystal Bed healing sessions. With deep understanding and utmost respect of this divine healing, they offer Extension of Casa Energies thru Crystal Bed Sessions and meditation ~ connection to The Casa Current ~ in their locations in New Jersey and New York. We open each evening sessions with prayer and tune into ~ connect to ~ the Current of The Casa…We invite you to experience Current Room Energy of Casa de Dom Inacio in our waiting/meditating area – come and sit with us before and/or after your session; or just come and sit; be and give your presence and receive…Everyone is invited and it is free. 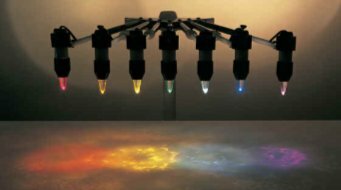 A Crystal Light Bed – vibrational healing device, sometimes also called an advanced chromotherapy machine, uses colored light beams focused at your chakras or energy centers through seven very pure quartz crystals. Click here to read about: The Creating of Crystal Bed. There is a lot more going on than just simple relaxation while you receiving your crystal bath. At the beginning of your session change of surrounding frequency is achieved and bridge between realms is created. While You are enveloped in love energy, your body is being filled with living particles of Light which works with you on cellular level. This combination of healing energies is further GREATLY ENHANCED by the Healing Entities of the Casa de Dom Inacio. As per Entity specific explanation from January 2016, there is No “human – channeled” Light during session, the Energy flows directly from the Entities and all work experienced during ~ is done at The Casa Dom Inacio. During ongoing sessions Ewa and Jan become part of the Current along with others who are present. As we are all equal, all who are present give and receive by assisting one another. Everyone is invited to come in and sit and meditate in The Current with us – it is free and no booking is needed; to book a session please see below. Sessions by appointment, to book please contact us. What is a Crystal Bed Session? ~ and it comprises Not only of monetary investment. If you would like to host Crystal Light Bed in your area please let us know. We would gladly travel to your area in service to others. We were honored to have our Crystal Bed -in service- at the Omega Institute- NY, during John of God’s visit in October 2014. There are many Crystal Beds from John of God around the world – to find location in your area please click here.